High accuracy and high stability of molding. 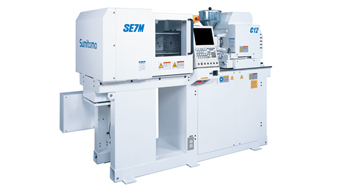 Sumitomo Plastics Machinery’s new SE7M Series direct-drive all-electric injection molding machines were developed for micromolding applications requiring the highest levels of precision (extremely tight dimensional tolerances) and exceptional productivity (high yield, multi-cavity, etc.). Like Sumitomo’s new SE-DU Series, the SE7M features four direct-drive, Sumitomo AC servo motors with full closed-loop control and digital sensors. Plasticizing, injection, clamping and ejection are controlled by these motors, and each motion except plasticizing uses a ball screw. All four motors are beltless, providing superior mechanical efficiency, repeatability and durability, and avoiding the problems associated with belt adjustment and dust. Synchro-plast control mode for resins with low viscosity or uneven pellet size. In this mode, control of both the screw position and back pressure are optimized, ensuring plasticizing stability. Flash speed mode that provides fast response control of velocity and pressure, before and after V/P switchover. It is used to prevent short shots and warp from over-packing. The SE7M is backed by a comprehensive Customer Satisfaction Program with Sumitomo’s standard-setting warranty program, worry-free parts, responsive field service and financing availability – plus advantages such as 3 days free in-plant training and expert processing assistance. Please use the SE7M Info buttons above at right for more information about this new series of direct-drive all-electric injection molding machines.